Nestled in the beautiful Pocono Mountains, surrounded by rich, green forest and stunning views of the mountainside is a golfer’s paradise. Woodloch Springs houses a professional-quality golf course suitable for players of all experience levels. Once you visit the course, you’ll understand why Golf Digest named The Country Club at Woodloch Springs “one of the finest courses in America” and one of the “Best Places to Play,” with a rating of 4.5 stars. And best of all, this course is only 10 minutes away from your room at Ledges Hotel. Whether you’re a pro or a novice, the Woodloch Springs Golf Course is sure to please. For more recommendations of local outdoor recreation, download our free Travel Guide. 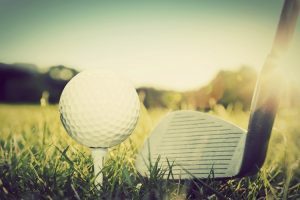 In it, you’ll find recommendations for things to do after your day of golfing at the Woodloch Springs Golf Course. This par-72 course includes 18-holes and spans over 6,500 yards. It features a fern-carpeted forest, flourishing wetlands, and upland meadows that stretch over the horizon. If you’re new to the game, there’s no need to be intimidated. Woodloch Springs Golf Course features four sets of tees and alternative pin placements, presenting a variety of challenges for golfers of all skill levels. One of the most impressive parts of the course is the 14th hole, which requires a 220-yard carry over “Hells Gate Gorge.” Can’t wait to see the course in person? You can take a look at the virtual golf guide, which gives you a bird’s-eye preview of the holes. The Country Club at Woodloch is dedicated to helping you improve your golf game, no matter your experience level. They have lessons that range from 30 minutes to one hour, as well as 30-minute junior lessons for the younger ones in your group. Their instructors are incredible. They have decades of golf experience and a passion for helping you improve. If you’re hoping for something more in-depth than an hour lesson, they offer golf school packages. These are a worthy investment for someone passionate about the game. Whether you choose the full- or half-day lesson, you’ll receive access to discounted rounds of golf, use of their practice facility, and a custom club fitting through Launch Monitor Fitting Analysis at the Woodloch Golf Academy Performance Studio. Are you visiting during the off-season? Did rain upset your tee time? You can still get the Woodloch Springs golf experience. The Indoor Golf Performance Studio allows golfers the opportunity to up their game. You can choose to play 9 or 18 holes and can select from 11 virtual courses. Grab some friends and share a drink while you practice. They have a maximum of four players and only charge by the hour, not the number of players. If the Indoor Golf Performance Studio is booked, visit their Virtual Driving Range. After your fantastic day of golf, return to your room at the Ledges Hotel to shower and change. Enjoy dinner at Glass – wine. bar. kitchen to refuel. Soak away any sore muscles in the Jacuzzi tub in our Deluxe Full-Service suite. No matter how you decide to indulge, Ledges Hotel is sure to make your vacation unforgettable. Don’t forget to check out our Specials & Packages to find out how you can further enhance your stay!